Experience Romance in this city of tomorrow. From Shopping to a happening Nightlife, Dubai has it all! A perfect getaway for families who need a break from the humdrum of daily life. With glittering high rises, a throbbing nightlife, and a plethora of adventurous activities, Dubai is a perfect Honeymoon destination. Experience the Luxurious side of this Gulf Country, where extravagance is just a way of life. A Complete package for Dubai with flights from multiple cities. Fly AWAY! From Desert Safaris & Dune Bashing to an evening with Arabic Music and Belly Dance performances, have a thrilling experience in Dubai! For those whose inner child is still very much alive, and to whom the idea of Amusement Parks, and Museums is enticing. The Trip was truly magical. "The trip was truly magical. Reading the itinerary was exciting enough but actually getting to experience the journey far exceeded our expectations. The company was incredibly professional and the guides that we had at each location made our 10 year anniversary trip even that more memorable." "Ease Tours company were absolutely stellar!!!!! I had the most amazing journey. It completely exceeded my expectations...... We 4 women travelers had a blast." 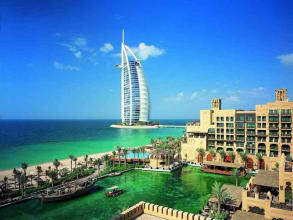 Dubai Escapade; 4 Nights of Bliss! What clothes shall we pack for a Dubai Trip? The weather in Dubai all around the year is mostly warm, due to its proximity to the Arabian Desert. Women are advised to wear full clothes, dresses, etc. that reveal minimal skin. Knee-length skirts, tops with sleeves, denims, etc. should be fine. Short skirts, tops with deep neckline or straps, etc, are prohibited in public areas. When visiting a Mosque, women should make sure to cover their hair, legs, and bodies, although covering the face is not mandatory. For Men, shorts (knee-length), denims, shirts, t-shirts, etc. are fine. Clothes like Cycling shorts, boxers, etc. are not encouraged to be worn in public areas. Although one can wear such clothes, while participating in any sports. Swimwear can be worn on the beach. What activities are famous in Dubai? 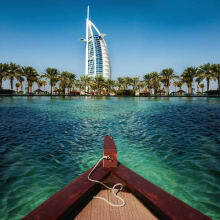 The Desert Safari & Dhow Cruise are two of the most famous activities in Dubai. Top that up with a Camel Safari, some Dune Bashing, Amusement Parks, and duty-free Shopping, and your Dubai trip will be complete. 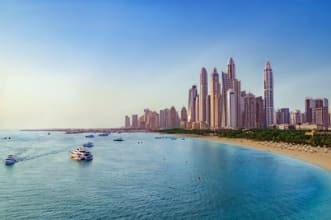 What is the best way to travel to Dubai? The best way of reaching Dubai is by Air. There are also options for people to hop aboard a cruise and experience the sea-route. Local food to try in Dubai? Arabic Bread - Arabic Bread like Khamir (made from flour, yeast & dry dates) is quite soft & flat. The traditional Arabic Bread is also known as Pita Bread by the rest of the World. The locals prefer to have the Chibab Bread, that is the same as Khamir but with lesser yeast. Hamour Fish - The Hamour Fish is the local fish of Dubai, fished from the Dubai creek. Mostly all local restaurants have this is as the primary fish variety for their dishes. Dates - Dates have been an integral part of the local diet for decades. Since dates flourish well in dry and arid conditions, the Arabian Desert offers the perfect climate for its growth. Camel Meat -Camel Meat used to be the most famous meat across Dubai, now mostly served at weddings and other social occasions. It can still be found at a few restaurants across the city, sometimes being used for burgers as well. Qoozi - Qoozi is a slow cooked lamb dish, served over rice with nuts & raisins, found only in specific restaurants across the city. Mandi - A Yemeni dish, popular all across the Middle-East, consisting of Meat & Rice with Spices. Hummus - Hummus is a dip made from cooked & mashed chick peas or other beans, traditionally served with Pita Bread. Falafel - A deep fried dish made from ground chickpeas or fava beans, or both, and is shaped like a ball. Al Harees - A local dish made from wheat, meat, and a little salt, served in the form of a porridge. What kind of a weather awaits us in Delhi? Dubai is partly surrounded by the Arabian Desert, and the weather stays either Hot, or even Hotter, with occasional rainfall, and frequent dust storms. The weather ranges from 20 degrees celsius to 47 degree celsius. Arabic is the mother tongue of most locals, but English is the most spoken language across the city, due to its exposure to the rest of the World. ATM's are easily available all across Dubai, and according to law, one is only allowed to carry upto Rs.10,000/-. An amount exceeding this has to be declared to the customs. Is Vegetarian / Jain Food available in Dubai? Pure vegetarian dishes are not hard to find in Dubai, due to its multi-cultural background. But it would always be wise to inform the restaurant, etc. about your preference. Also convey your meal preference to your Travel Operator, so that plans can be made in advance. What does Abu Dhabi have to offer to Travelers? Located a couple of hours away from Dubai, Abu Dhabi is the capital city of the UAE. For travelers there is the World renowned Ferrari World - a Motorsport themed entertainment park, and also the Yas Waterworld located on Yas island. One must also try and visit the Falcon Hospital (built for injured and ill falcons) that provides guided tours for interested visitors. 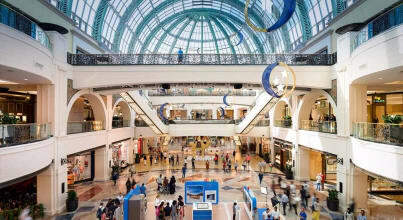 Dubai Mall is a premier mall that also provides entry to the Dubai Aquarium & Burj Khalifa. Equipped with an ice-skating ring, a gaming zone, and a multiplex, this Mall offers entertainment for all. The Dubai Mall also features the well known Dubai Shopping Festival in the month of January, that attracts a lot of shopping enthusiasts. 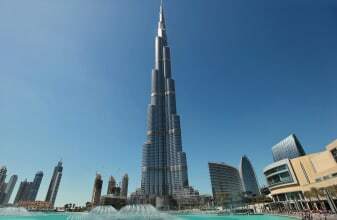 Burj Khalifa, the tallest Building in the World, standing at a height of 2723 ft. It is the landmark building of Dubai, that has an observation deck located at the 124th floor. This is the same building that Tom Cruise was trying to scale in Mission Impossible: Ghost Protocol. It took 6 years of hardwork to build this architectural marvel from ground-up. It is nearly thrice as tall as The Eiffel Tower, and twice as tall as The Empire State Building. Talking about the Tallest Buildings in the World, Burj Al-Arab happens to be the World's third tallest hotel extending to 1053ft. The Hotel standing on a man-made island, exudes extravagance, that also has an underwater aquarium restaurant called Al-Mahara. The hotel has been built in the shape of a sail of a ship, and is the only 7 star hotel of the World. Running through the center of the City, the Dubai creek divides the city into two parts - Deira to the North, and Bur Dubai to the South. Due to the construction of a canal decades ago, Dubai became one of the major port cities of the Middle-east. A cruise along the Dubai Creek, also termed as the Dhow Cruise is highly recommended with the boat operators having various sorts of on-board entertainment like Tanourah Dance show, Barbeque, etc. The Dubai Aquarium is located on the ground floor of the Dubai Mall, that houses close to 140 species of sea-life. One can also opt for cage snorkeling and shark diving activities, for a thrill; or a ride on a boat with a glass bottom. A walk through the tunnels of the underwater zoo gives a glimpse of varied species of sea animals & plants. The Jumeriah Mosque, inspired from the Al-Azhar Mosque in Cairo, is the most beautiful Mosque of Dubai, and is a perfect example of Islamic architecture. Daily Tours, for better understanding of the Muslim faith, are conducted by the Sheikh Mohammed Bin Rashid Centre for Cultural Understanding, everyday of the week except Fridays. Located near the Global Village, the IMG Theme Park provides immersive entertainment for the young & the younger. From Marvel characters, to dinosaur themed zones, and a Cartoon Network Zone, this Theme Park has something for every age group. A pleasant break for families & friends. Located just towards the South of the Jumeriah Beach, the Kite Beach is a hub for kite surfers and other water sports enthusiasts. Also frequented by sun bathers for a lazy day out under the sun. This famous water park is located at Atlantis - the Palm on the Palm Jumeriah, Dubai's celebrated man-made Island development. The World's longest water slide - Aquaconda, is located here, which is around 9 storeys tall, and is aptly referred to as 'The Leap of Faith'. The Park boasts of underwater safaris, and a white sand beach to chill out on, after a hectic day of amusement at the park. The Dubai Parks & Resorts features 3 Theme Parks & a Water Park - The Motiongate, Legoland, Bollywood Parks & the Legoland Waterpark. The Riverland and a Plynesian themed Family Resort is also a part of the Dubai Parks & Resorts. This Mammoth project ensures that all your entertainment needs are present at one place.